From left, From left, Sean Backus, Carson Smith, Hunter Forsythe, Jack Gray, Kay Zimmer from the cancer center, Tucker Jordan, Kyle Burgess and Brett Murphy. 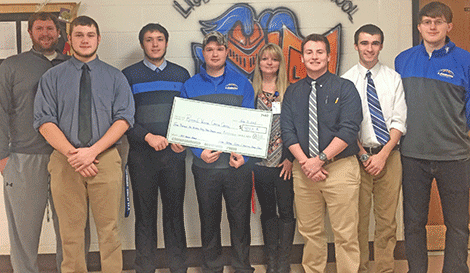 LISBON -- On Jan. 12, the communities of Lisbon and Heuvelton got together Battle Cancer Night and raised $4,153.31 to be donated to the Richard E. Winter Cancer Center in Ogdensburg. The night featured boys and girls modified teams, boys JV and varsity teams and the sixth grade boy's teams from both schools playing each other. "It was a great crowd and fun night for the participants," according to a news release. "The night was made possible through collaboration of Erika Backus and Dave Steele working on the scheduling, Josh McAllister and Jenn Gray organizing the t-shirt sales in Heuvelton and especially the tremendous support from the two communities."